Hello, everyone! 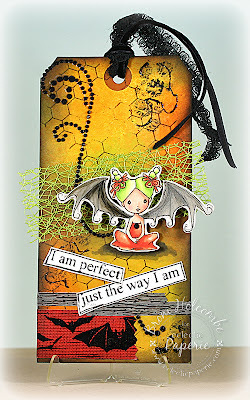 It's Broni here and today I'm showing you a Halloween tag I made using lots and lots of Distress inks! I printed my little Dragon Cutie image, cut her out, and colored her with my Copic markers. I also added a second colored layer of vellum to her wings. The manila tag was sponged heavily with Crushed Olive, Dried Marigold, and Spiced Marmalade Distress inks then spritzed with some Dylusions spray inks in Pure Sunshine and Fresh Lime. The entire outer edge was sponged with Black Soot Distress ink. Then I lightly stamped the Honeycomb background stamp from Market Street Stamps in Black Soot Distress ink and added some swirls with Black Diamond Stickles. I also stamped the Dylusions sentiment from The Right Words in Black Soot and cut it out. Finally I added some bling, Halloween tapes and ribbons and mesh to complete my tag. Thanks so much for dropping in! See you soon! So much fun Broni! Love the colors and all the embellies on this tag! Awesome tag and LOVE that sentiment!!!! Love the intensity of the blended colours in the background - fabulous tag!